Welcome to Day 13 of the 31 Days 31 Printables series. If you’re just joining us, I’m spending the whole month of October sharing at least one free printable each day. Right now I’m working on updating my holiday planner printables, and I’m loving how they are turning out. Today’s printable is a version of one I’ve already shared this month, but I did receive a few emails asking if I was going to make one that matched the other new holiday planner printables, so without further ado, here is the Holiday Hostess Cheat Sheet! When I first created this printable, I never imagined it would be as popular as it is. It was just a simple way for me to stay on track when getting ready to host holiday get togethers. I must confess, this one isn’t in my holiday planner, I keep it out and handy so I can reference it whenever we plan to have company over. I changed nothing about this except for the colours and fonts to help make it match the rest of the updated holiday planner printables. Maybe I’m weird but I like it when they all match. I love having a list of my typical to-do’s on hand like this. It makes getting ready for company so much easier. I don’t even need to really think about it, just grab the list and start plugging away at the items on the list. 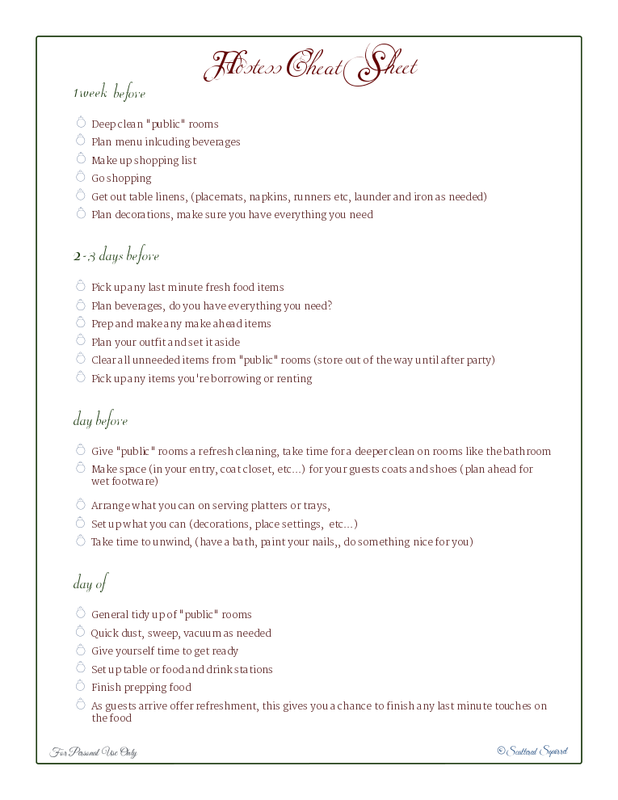 The last thing I want is to do is be scrambling at the last-minute, with a simple list like this holiday hostess cheat sheet, I’m much more relaxed the day of the event and I find I’m able to look forward to visiting with our family and friends, rather than frantically, if not desperately, hoping that I didn’t forget anything. Do you have a typical list of things you like to do before hosting company?